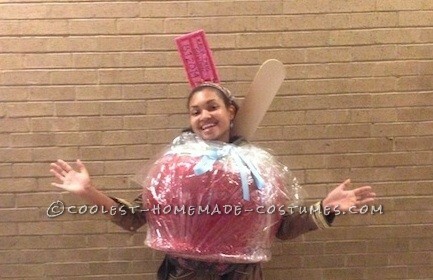 World's Best Candy Apple Costume! 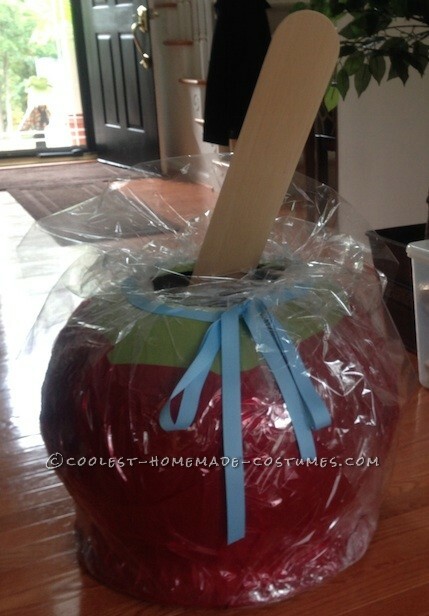 World’s Best Candy Apple Costume! This idea came about because one of my graduate school student associations was having a candy apple sale and I needed a gimmick to draw attention and make sells. Just so happens that this candy apple sale was the week before Halloween so the costume could be worn then as well. I had to think long and hard on how to create this costume as I tried to do some Internet research and could not find a candy apple costume ANYWHERE! The most difficult part about this costume was finding or making a sphere shape. I had come across the ball costumes on your website but they were made of paper Mâché and needed weeks to make. I however only had 1 week until I needed to wear this costume. Luckily a light bulb eventually went off and I figured a giant cauldron would work! I added some paint, a stick of wood, cellophane and of course a Carolina blue bow and the rest is history! This has to be the easiest homemade but elaborate looking costume ever. This costume drew a lot of attention since everyone I encountered never saw a candy apple costume before. I received lots of compliments, shocked faces and the occasional requests for bites.